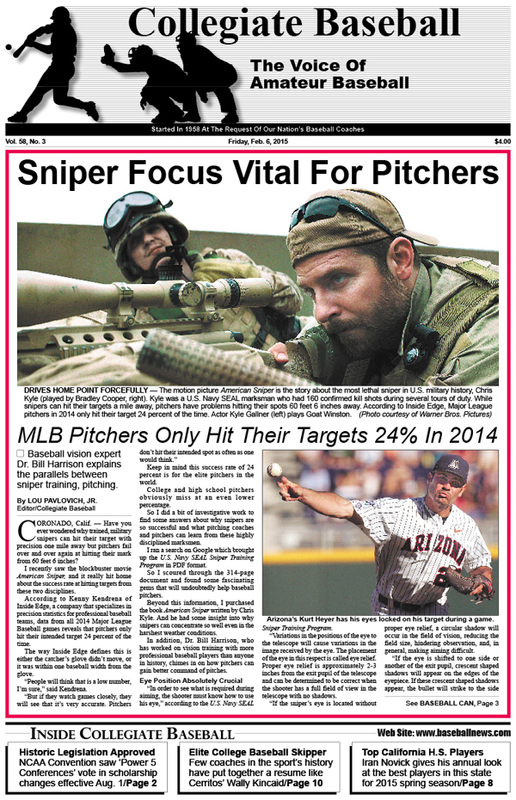 • Special Report: Sniper focus vital for pitching success as MLB pitchers only hit their targets 24% of time in 2014 season. • 2014 Draft Analysis: Duke Dickerson uncovers eye-opening numbers that show why college baseball is still the preferred choice for pro organizations. He looks at different college divisions, high school and the top NCAA Division I conferences broken down 1-10, 11-15, 16-20 and 21-32. • Scholarships enhanced by “Big 5” conferences at NCAA convention which spells big trouble for other conferences across the USA. Only time will tell what happens in sport of baseball. • Don George Column: Is our national pastime on life support? Why are fewer and fewer kids playing sport of baseball and watching it on TV? • Editorial: Unsanitary conditions must be addressed in baseball which can cause deadly conditions such as bacterial meningitis. • Ruleball With Rich Marazzi: 2015 rules’ quiz will test even the most accomplished rules experts across USA. • Elite California H.S. Players Named: Iran Novick presents his annual list of superb prep players across the state for 2015. • Amazing Hall Of Fame System: Wally Kincaid put up incredible win numbers at Cerritos College as he led teams to 6 California state JC titles and produced an incredible 60-game winning streak that spanned three seasons – the longest in baseball history. • Justin Dehmer Column: Five thoughts to remember on praising players for coaches. • Charlie Greene Column: Nobody could ever match the wit and wisdom of John Scolinos, former head coach at Cal. Poly Pomona. • Tom Kovic Column: Financial aid is a hot topic for many baseball players. To purchase the Feb. 6, 2015 edition of Collegiate Baseball, CLICK HERE.